Well, it seems it won't be long before these two get reacquainted. Lewis Hamilton heads to the next race with a 59 point lead over Sebastian Vettel. It's going to take something special for Vettel to turn things around but if he does it, what a comeback that will. Four races left. The United States Grand Prix up next in two weeks. For Andrew Benson's take on how the race unfolded, read his report here. Lewis Hamilton speaking to Sky Sports: "For the first half of the race I was under control and the second half was a lot harder. Verstappen looked so big in my mirrors but I am pretty grateful the car stuck together. "I wouldn't say I have one hand on it (the drivers' championship). There are 100 points available so I will keep the pedal to the metal." Vettel gets reprimand for "failing to attend the national anthem at the the required time" on grid. Probably not his biggest concern at the moment. Red Bull team principal Christian Horner, speaking to BBC Radio 5 live, asked about Lewis Hamilton's lead in the title race: "Can he lose it? I doubt it very much. "That is a killer blow for Sebastian today. It is difficult to imagine Lewis not winning this championship but anything can happen." And here's how Lewis Hamilton won the Japanese Grand Prix in audio form. For the benefit of anyone just waking up and checking in to see what happened, here's a summary of the race. Lewis Hamilton took a giant stride towards his fourth world title with victory in the Japanese Grand Prix. Title rival Sebastian Vettel retired four laps into the race after dropping down the field from the start with an engine problem. Hamilton now leads the German by 59 points with 100 available in the remaining four races. He will clinch the title at the next race - the United States Grand Prix in Austin, Texas - if he wins and Vettel finishes lower than fourth. A few stats to sling your way. The win was Lewis Hamilton's fourth in Japan, equalling Sebastian Vettel's record. It was also his eighth win of the season and 61st of his career. A fourth title would take Lewis Hamilton into a different league again. He has just got so strong. The steamroller is continuing. Rod Peel: So Lewis ‘probably’ will win this championship making him the most successful British driver. When will he get a knighthood? Red Bull's Daniel Ricciardo, who finished third: "This is my first podium here. It feels great. It is a circuit I have always enjoyed and with this year's cars it is lot of fun. "After the start the race spread out and it wasn't much fun for me but then I had Valtteri (Bottas) coming at the end so to have pressure at the end was good." Max Verstappen, who finished second: "It was a great day again. I really love the track. We had great pace - just really hard to pass. I tried my all. "As soon as we switched to the soft tyre we were really competitive." More from Lewis Hamilton: "We have had such a great crowd this week you always look after us so well and the support was immense so I am grateful for that. The track was fantastic. "The team did an incredible job. Max (Verstappen) had an outstanding race. It wasn't an easy one at all." 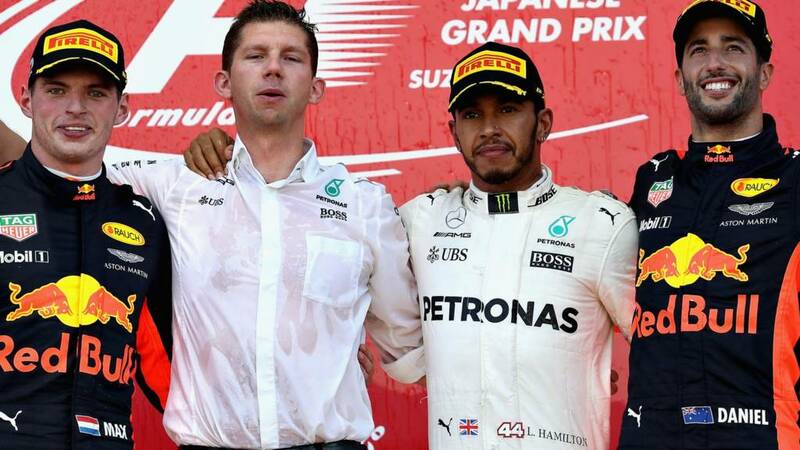 Japanese GP winner Lewis Hamilton: "I could have only dreamed about having such a gap in the standings. "I owe everything to the team. They are meticulous." Blast from the past as former F1 driver Takuma Sato comes out onto the podium to conduct the interviews. Sebastian Vettel and all of the Ferrari staff will be absolutely devastated about their run of reliability issues. If I have got my maths right, Lewis Hamilton can win the world title at United States Grand Prix in two weeks' time if he wins and Sebastian Vettel finishes fifth or lower. How things have changed in a little over a month. Lewis Hamilton bounces out onto the podium. He's pretty much on easy street for the remainder of the season. Big, big step towards a fourth world title for Lewis Hamilton. He now leads Sebastian Vettel by 59 points with just four races to go. Josh Earl: Yes Lewis!!! A bit nervy at the end! 1 race win away from the Championship!! Rachel T: YESSSSS LEWIS! Kept his head and brought it home!